No utensils or napkin? 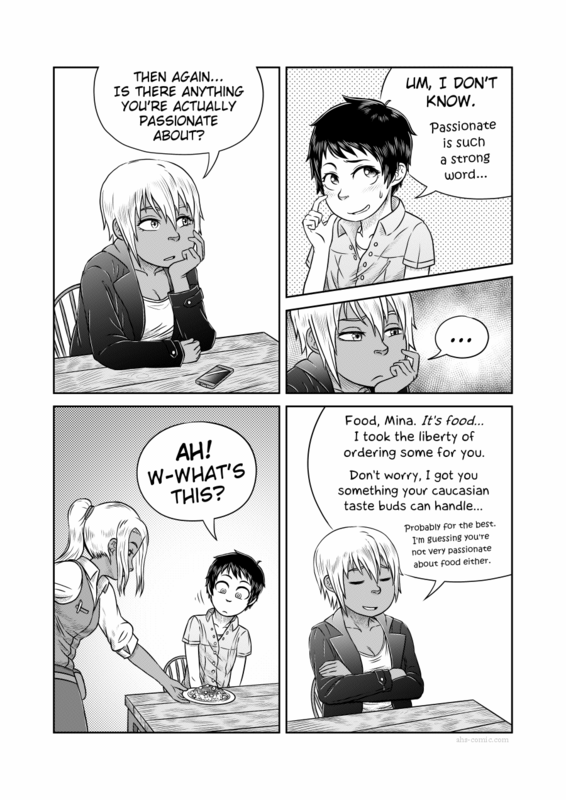 I cannot wait for the next page, where we see Mina with her face in the plate nom nom nom nom nom nom nom! Ha! Don’t know why I thought about that, really. About 1/3 the world eats with “silverware” (made of whatever metal); 1/3 eats with two sticks of wood (or substitute material), and 1/3 eats with their bare hands. There’s far too many in each group for any to point at the other and call them “strange”. Did her clothes suddenly switch back and forth in panels 3 and 4? That’s what happens when I flip the canvas too much. I mirror the image because it helps to find mistakes, but sometimes I forget about it and draw things wrong. On an unrelated note, do you have ad banners for AHS that can be used to link here? I was looking for them on the “Support me” page, but couldn’t find them (and also couldn’t find an email address). But if the demand is there maybe I should make some? The email is a bit hidden for similar reasons. You can find it by clicking my tiny name below each comic post. Hmm, probably not worth the bother — I couldn’t remember how I found AHS and thought I’d seen an ad for it. I think I can just cut something out of the page header myself for what I need. I’m curious: someone commented that the people of Erin’s land are japanistic but with blond hair-? Something like that, if you will…. Well, I guess their culture is similar; A very westernized Asian nation. Their appearance is different though, they have brown skin and a lot of them do have blonde hair, which is weird and I might go into that later. Does Erin come from the same region as Kaolla Su from Love Hina?? But seriously, that’s what’s thrown me off. AND….we also need to deal with Mina’s issues. I gotta wonder what IS setting her off. Just noticed the scary looking person at the bottom right of this page. Scary. On another note, do you have any videos of you drawing these guys?